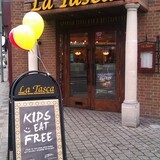 It's time for a Spanish fiesta at La Tasca, Kingston. The restaurant is fully kitted out in the Spanish theme with Spanish flags, music and even the waitresses were wearing flamenco dresses. La Tasca works well for a romantic meal with that special someone as you can find a quiet dark corner overlooking river, or if you're in the party mood the restaurant has plenty of space for big groups without feeling overcrowded. La Tasca is beautifully lit with ornamental lights and fairy lights, giving it that cosy mood whilst still being a spacious restaurant. It is easy to imagine celebrating any occasion in La Tasca be it anniversaries, birthdays or even Christmas parties. I noticed on the menu that there are deals on tapas dishes (around £20) for large groups. La Tasca has quite a large selection of wines and a rather extensive range of tapas, but I would personally recommend the paella. The waiting time was longer for paella than tapas but its presentation and taste were exquisite. It also occurred to me that a dish of paella (which is a generous portion) was better value for money at around £10 rather than spending £5 each on lots of tapas dishes. Of course if you've never had tapas, or simply want to try some really good ones then I wouldn't rule it out altogether, it would just mean spending a little more. Try the meatballs, the bread crumbed chicken and the chef's specials, although the temptation to try them all will keep me going back for more. The value of the cocktails at £5 each is also something not to be missed. The staff at La Tasca were true to the theme of Spanish hospitality and were very welcoming, helpful and courteous. I could not help but be fascinated by their themed uniforms which really added to the Spanish feel. Located in central Kingston right near the Rose theatre La Tasca makes a great place to sit and enjoy the river by day and a perfect pre-show place to eat by night.